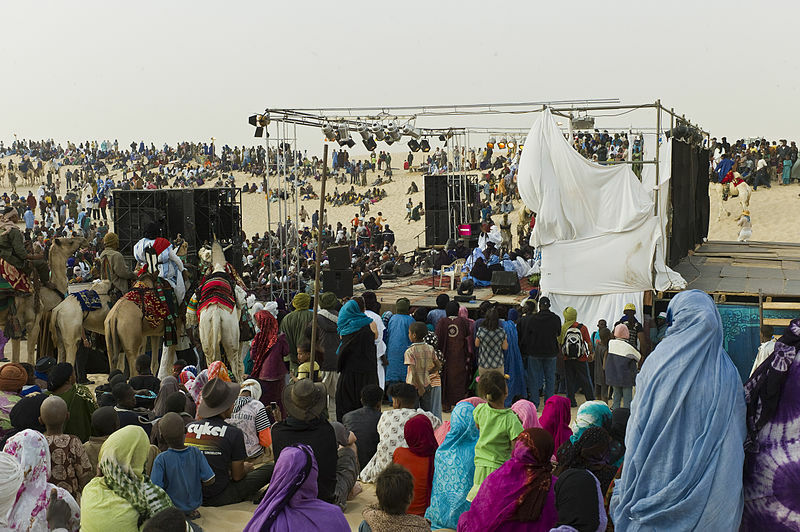 This year due to the political unrest and difficult security situation in Mali, the 13th edition of the Festival au Désert – by now one of the largest and most important music festivals in West Africa attracting some 5,000 visitors – could not be held in Timbuktu. Currently, the musicians of the Tuareg nomads are presenting their “festival in exile” at different locations in West Africa. Since 16 November 2013, the “caravan of peace” has been underway from Morocco to Burkina Faso. The musicians see themselves as promoters of a peaceful exchange between the peoples, by providing a forum for the music cultures of West Africa and serving as their window to the world. At the invitation of Christoph Schlingensief’s Operndorf Afrika (Opera Village Africa) and the Stiftung Partnerschaft mit Afrika e.V. (Partnership with Africa Foundation), for the first time ever the “IN EXILE: Festival au Désert” is presenting films, discussions and a major concert in Germany. From 8 – 10 January 2014 the African festival is guesting in Berlin at Volksbühne, Akademie der Künste and Kino Babylon.